Introducing Neptune’s Harvest Lawn Starter! From home owners to landscapers, sod farmers to golf courses - Lawn Starter provides nutrients needed to improve vigor, color and root density of new lawns, lawns requiring repair or phosphorous deficient lawns. 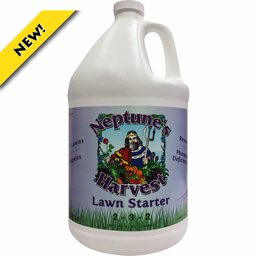 This product is intended for new lawns, recent repairs, reseeding and lawns deficient in phosphorus. It may also be used on flowers, vegetables, trees and shrubs.